The Community Foundation of Tampa Bay wants to make your giving experience as easy and meaningful as possible, whether you make a single gift, set up a fund or foundation, or plan for your charitable legacy. The Donor Advised Fund – a giving fund – offers a convenient, versatile way to make charitable contributions when and how you choose. Think of it as a charitable checking account: You make an initial donation and claim the maximum tax benefits allowable by law. Then you decide which nonprofit organizations you want to support with grants. Add to the fund any time you want with cash, stock, or other assets. Easy: We manage and invest the fund – and take care of all the paperwork — so you can enjoy giving without the administrative hassles. Personal: You direct your gifts to the organizations or projects that are meaningful to you. We’re here to guide you if you want, or we can leave it completely up to you to select the nonprofits you support if you wish. Convenient: You can monitor your balance, make grant recommendations and add to your fund online – whenever it’s best for you. Private: Your gifts can be anonymous if you like, or your grants can be acknowledge to inspire others to give. You choose. Impactful: As a community of givers, donors at the Community Foundation of Tampa Bay are catalysts for real and lasting change in our region. Contact us at 813.282.1975 or info@cftampabay.org to learn more about establishing a fund. See the list of our donor advised funds. For donors with a deep commitment to philanthropy, a personal, family or corporate foundation within the Community Foundation of Tampa Bay offers the benefits of a private foundation without the cost, time and administrative hassles. You, your family or your business can focus on the joys of giving while our Office of Philanthropy takes care of the behind-the-scenes details. A foundation within the Community Foundation of Tampa Bay offers all the practical benefits of a Donor Advised Fund along with added support from the Community Foundation of Tampa Bay. A foundation within the Community Foundation of Tampa Bay also garners a more favorable tax treatment and lower operating expenses than a private foundation. Ease: You contribute to your foundation when and how you choose, all while claiming the maximum tax benefits allowed by law. Giving Flexibility: You choose who can give from your foundation — an individual, family members or a committee. And we help you customize your plan for your successors. 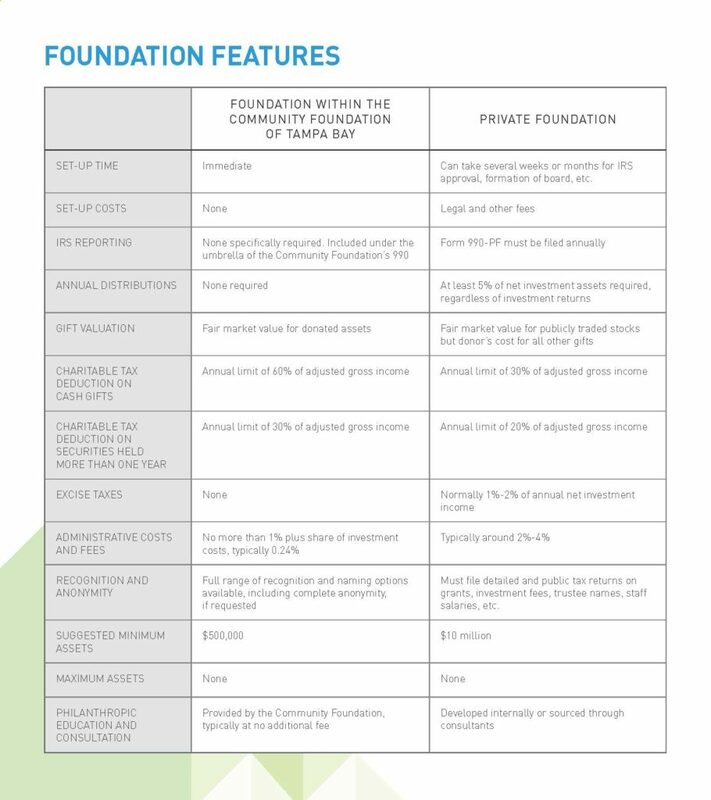 Unlike private foundations, there is no annual distribution requirement. Hassle-Free Administration and Grantmaking: We provide all administrative services, including IRS reporting, accounting, record-keeping and compliance. We process and send all of your grants with a customized letter after verifying the IRS status of the nonprofit. Investment Flexibility: You can choose how our professional managers invest your philanthropic assets on your behalf — for the short-term, intermediate term or long-term. Or you may recommend your own investment advisor. Contribution Flexibility: Of course, you can open or add to your foundation with cash. But you also can contribute appreciated stocks, retirement account assets, real estate, cryptocurrency, life insurance, business interests and other complex assets. Cost-Effectiveness: Administrative fees are significantly lower than those associated with a private foundation. And all fees to the Community Foundation are reinvested in our philanthropic work in the Tampa Bay community. Special Services: Our Office of Philanthropy provides our foundations with assistance in facilitating annual meetings, research on nonprofits and trends, customized grants reports, and invitations to an annual convening of foundations and other special events. Branding and Recognition: You can brand and promote your foundation in the same way as a private foundation, including logo, stationary, website and more. If you choose, your foundation can accept online contributions from the Community Foundation of Tampa Bay’s website. Contact us at 813.282.1975 or info@cftampabay.org to learn more about establishing a foundation. See the list of our Family Foundations. Make a gift that will last for years to come. A specific cause or area of interest, such as education, the arts, youth, animal welfare or the environment. Needs and opportunities in the community identified by the Foundation. With an endowed designated fund, you provide a lasting legacy for your favorite nonproﬁts, which will receive a gift in your name forever. If that organization ceases to exist, the Foundation will redirect the funds to an organization with the same mission to meet your charitable intent so that your generosity will continue to beneﬁt the community in the way that you envisioned. An endowed ﬁeld of interest fund allows you to focus your charitable giving on issues and causes that are meaningful to you. You identify an area of concern that sparks your philanthropic interest (such as education, the arts, or animal welfare) and the Foundation directs grants from the fund to the most appropriate and effective organizations working in that area. This type of fund allows your grantmaking to evolve as the needs within the ﬁeld do. And it gives you peace of mind knowing that the Foundation will be there to identify the best nonproﬁts to address the issue you selected. An unrestricted fund places your trust in the Foundation to make grants that respond to the Tampa Bay region’s most pressing needs and challenges. As needs change, so can the Community Foundation’s response. A scholarship fund can benefit the education of students at a particular school, from a geographic region or interested in a specific area of study. Easy: We accept gifts of cash, stock, insurance policies, real estate or other complex assets to establish your endowment. Then we manage and invest the funds – and take care of all the paperwork – to eliminate any hassle for you and the organizations you support. Personal: You direct your gifts to the organizations or causes that are meaningful to you, and you can be assured that your intentions are carried out in perpetuity. Private: Your gifts can be anonymous if you like, or your grants can be acknowledged to inspire others to give. You choose. Impactful. As a community of givers, donors at the Community Foundation of Tampa Bay are catalysts for real and lasting change in our region. Our staff and Board of Trustees know the community and can direct your gifts to the organizations that can do the most for our region. *Grants from unrestricted and field of interest endowments are expertly stewarded to nonprofits by the Foundation’s Board of Trustees. You can create a legacy of giving for generations to come with an estate gift to the Community Foundation of Tampa Bay. We work with you and your professional advisor to choose the planned giving option that best meets your charitable goals. Your estate gifts can go to create or enhance an existing fund or to support the overall work of the Community Foundation in our region. Donors who have remembered the Community Foundation of Tampa Bay in their estates are recognized as members of our Legacy Society. You also can choose to remain anonymous. A bequest in your will or trust – This is an easy way to fund your charitable goals. You can create a new endowment or add to a fund already in existence. You can leave a specific amount, a percentage of your estate or what remains after other obligations have been satisfied. Retirement plan donations – Naming the Community Foundation of Tampa Bay as a beneficiary of your IRA, 401k or 403b retirement plan is a simple way to fund your and may minimize tax implications to your heirs. Life insurance – You also can name the Community Foundation as a beneficiary of your life insurance policy or gift the policy and likely receive an immediate tax deduction. Policy proceeds can establish a fund that meets your charitable wishes. Charitable trusts and gift annuities – A number of giving vehicles allow both income and charitable donation with a favorable tax advantage. Please contact us at info@cftampabay.org for details on Charitable Gift Annuities, Charitable Remainder Trusts, Charitable Lead Trusts or other trusts and annuities.